How much does it cost to travel to Cairo? How much money will you need in Cairo? E£443 ($26) is the average daily price for traveling in Cairo. The average price of food for one day is E£57 ($3.30). The average price of a hotel for a couple is E£587 ($34). Additional pricing is in the table below. These average travel prices have been collected from other travelers to help you plan your own travel budget. How much money do I need for Cairo? Cairo is the chaotic capital city of Egypt. With a population of more than 16 million, it is one of the largest cities in both Africa and the Middle East. As a traveler, you're likely to arrive and leave from here and you'll get your first orientation to the area during the chaotic and congestion filled taxi ride from the airport. Cairo sits on the famed Nile River and is filled with history and culture. The city is filled with sights and attractions, but there is also an atmosphere that combines the old and new. The city is an excellent place to explore and experience a modern, yet traditional Middle Eastern capital. Cairo's climate is a hot desert climate. The humidity is usually higher than you might expect due to the proximity to the Mediterranean Sea and the Nile Delta. Wind storms are common, particularly between the months of March and May. During this time the air can be very dry. High temperatures in the winter months can be anywhere from the mid 60s Fahrenheit to the mid 80s. During the summer the highs can climb over 100 degrees Fahrenheit. Rain is rare, but more common during the cooler months. There remains an ongoing threat of terrorism in Egypt and visitors to Cairo should remain alert and aware of their surroundings. Research any current developments prior to any visit to the area. Most people think of the Pyramids when they think of Cairo, but there really is so much more to this city. You should easily allow at least three, if not more, days to fully explore even the most popular sights. You should definitely not miss the Egyptian Museum, which is conveniently located in the middle of town. You can spend hours seeing the artifacts that date back thousands of years. The museum is divided into many rooms and you'll find fascinating objects on display, and also scattered almost randomly around the room. 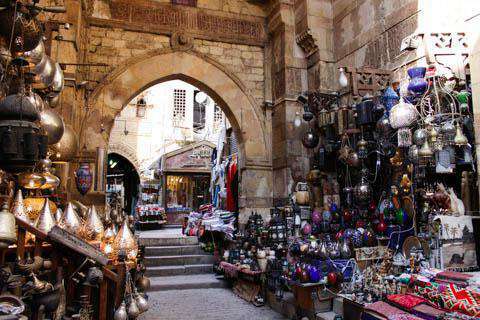 In Old Cairo you'll see most of the Coptic sights, which offer you a glimpse into a very different side of the city. You can also take a stroll down the famed Nile River where you'll see plenty of young Egyptian couples out walking and taking in the evening light. Cairo is a large city that covers a vast area. The central core can be divided into 11 districts. These are Midan Tahrir, the Downtown, Midan Ramses, Garden City, Islamic Cairo, Old Cairo, Dokki Mohandeseen, Gezira and Zamalek, Giza, Heliopolis and Nasr City, and Ma'adi. Midan Tahrir is where you'll find the Egyptian Museum, many hotels, and "Liberation Square". Midan Ramses is where the main railway station is located and Garden City is a suburb near the city center and a good option for accommodation. As Cairo is a large city, there is no shortage of activities that you can enjoy while you're in town. Many visitors take a felucca ride along the Nile River. Feluccas can be found across from the Four Seasons Hotel in the Garden City. It's possible to charter a ride and negotiate a fair price. It's also worth visiting at least one of Cairo's many parks. Probably the most famous is the Giza Zoo. Other options include Al Orman Gardens, Al Azbakieya Gardens, Genenet El Asmak, and Merryland, among many others. Cairo has a large number of excellent restaurants that offer everything from traditional Middle Eastern foods to international cuisines. It's best to avoid those that are listed in guidebooks, as the quality often slips as the price goes up. If you're looking for cheap food, then casual street restaurants and street stalls may be your best option. The downtown area in particular has a lot of budget food options. The Nile is also lined with some of the city's best restaurants, which offer a delicious tasting of Egyptian cuisine. The food is comparable to Middle Eastern food elsewhere, with only subtle differences in the types of cheese used or the style of hummus. Many of the restaurants along the Nile are more expensive, but the ambiance and the quality of the food make them easily worth the added expense. Cairo has a great metro system that you can use to reach many places around town. It can be very chaotic and crazy, especially during rush hour, but it is cheap and fast. Do keep an eye on your wallet during your ride. Taxis are another good alternative. They are reasonably priced if you're a good negotiator, but be prepared to barter hard as some drivers can be quite stubborn in their prices. Public buses also travel around the city. This is one of the cheapest travel options, but they can get quite crowded. Women should use caution when choosing this form of transportation as there are frequent problems with sexual harassment. Make sure you check out the Birqash Camel Market. It's about an hour ride in a taxi from downtown Cairo. There's a small admission fee, but once you're in you can take pictures and wander around all you want. There are camels everywhere and all of the men are there to buy and sell them. There are impromptu auctions which are very interesting. Try not to get trampled! Cairo is an amazing city packed full of everything from markets, to monuments, museums, interesting neighborhoods. Oh, and of course the pyramids. Definitely allow yourself more time in Cairo than you think necessary. It's a wonderful city to spend some time and get to know. There are such diverse neighborhoods that you'll easily be entertained no matter how much time you have. Also, head to the pyramids as early as you possibly can. The cruise ships dock in Alexandria and then make the drive to the pyramids in time to arrive in the late morning or early afternoon. If you beat these crowds, your experience will be so much more enjoyable. If you're early enough you may even miss most of the touts. And of course, the lighting when the sun is low makes for the best photographs. Cairo Day Tour to Egyptian Museum, Citadel and Bazaar Discover Cairo sightseeing and Immerse yourself further into Egypt's history as your own private Egyptologist tour guide from Egypt Excursions Online and learn more about Egyptian Museum, Alabaster Mosque, Khan el-Khalili Pick up from your hotel in Cairo and enjoy a day's sightseeing to the Egyptian Museum featuring artifacts from the Pharaonic period The museum displays a rare collection of 5000 years of art which is considered the largest, most precious collection of Egyptian art in the world Over 250,000 genuine artifacts are presented, including an exhibit dedicated to King Tutankhamen's collection of treasure, gold and jewelry which was enclosed in his tomb for over 3,500 years before its discovery in the 1922. Enjoy a relaxing experience of a felucca ride along the River Nile, where you can discover the amazing nightlife of Cairo or enjoy the warm sun during the day.